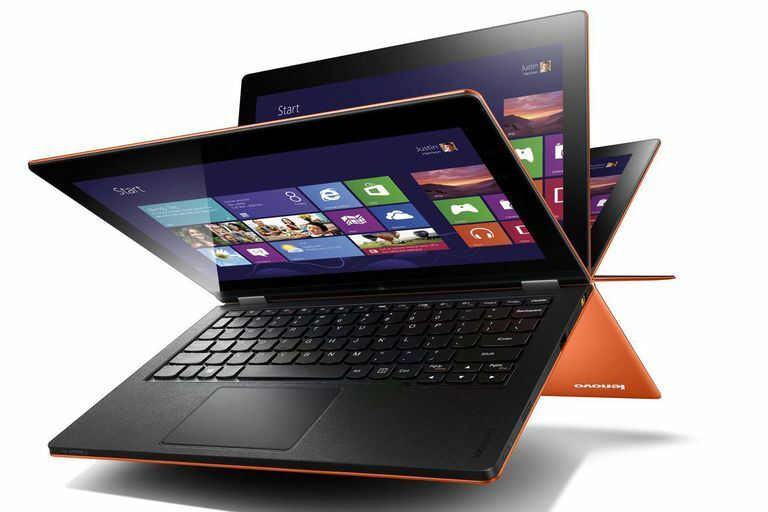 What Is a Hybrid or Convertible Laptop? lenovo.com / Lenovo Group Ltd. Since the release of Windows 8, there has been a greater emphasis on having a touch-enabled screen for the user interface. One of Microsoft's goals with the new software release was to unify the user experience between a desktop, a laptop, and a tablet computer system. One way that manufacturers are addressing this is by producing a new style of laptop called either a hybrid or convertible. So what exactly does this means for consumers? In essence, a hybrid or convertible laptop is any type of portable that can essentially function as either a laptop or a tablet computer. They are of course referring to the primary means of data input. With a laptop, this is done through a keyboard and a mouse. On a tablet, everything is done via the touchscreen interface and its virtual keyboard. They are still primarily laptops in their basic design. The most common method to create a convertible laptop is to create a touchscreen display that opens out of a clamshell design like a traditional laptop. To convert the laptop into a tablet, the screen is then either rotated, pivoted or flipped such that it then is back into a closed position but with the screen exposed. Some examples of this include Dell XPS 12, Lenovo Yoga 700, and Lenovo LaVie Z 360. Each of these uses a slightly different method for taking the screen and folding, sliding or pivoting the display. Tablet computers aren't really new. Back in 2004, Microsoft released their Windows XP Tablet software. This was a variant of the popular Windows XP that was designed to be used with a touchscreen but it didn't really catch on as the touchscreen technology was still relatively expensive and rudimentary and the software not well optimized for the interface. In fact, the most popular XP Tablets sold were actually convertibles that essentially were just laptops with touchscreen displays. Some of them could rotate or fold the screen much the same way that they do today. Of course, there are drawbacks to convertible laptops. The first and foremost problem is their size. Unlike tablets, the convertible laptops must be larger in order to include the keyboard and peripheral ports required of the larger and more flexible laptop designs. This meant that they can be a lot heavier than a straight tablet. This generally makes them larger and heavier than a tablet which is not easy to use for extended periods of time. Instead, they are more flexible when it comes to using them in non-traditional modes that are not carried such as a stand or tent mode that keeps the screen up and accessible but folding the keyboard behind so it is not in the way. With the increasing technological advancements in terms of low power consumption and less heat generated, laptop computers continue to get smaller. As a result, there are now many kinds of convertible laptops available on the market that are much more functional as tablets than they were in the past. In addition, there is also a trend in the new 2-in-1 style of systems. These differ from the convertible or hybrid because they tend to have all of the computer components inside of a tablet and then feature a dockable keyboard that can allow it to function as a laptop. Is a Hybrid Laptop Something You Should Consider? In general, the most functional of these laptops tend to be extremely expensive in order to provide the engineering to be as close in size and weight to a stand-alone tablet. The problem is that they generally sacrifice some performance in order to get to that size. As a result, you are either looking at something as large as or bulkier than a regular laptop or something that is very expensive and sacrifices performance compared to a straight laptop. The advantage is that you would not necessarily need to carry two devices.